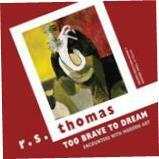 The poems in Too Brave to Dream were found several years after the poet’s death in 2000. They were interleaved between the pages of two books of modern art reproductions that were among volumes from Thomas’s personal library that had been acquired by Bangor University. Thomas had published some ekphrastic poetry in the 1985 collection Ingrowing Thoughts; but his poetic responses to the images reproduced in the present volume remained as notes and sketches which seem never to have been offered as submissions to magazines. This is vintage Thomas – an urgent and uncompromising cry of protest against the perplexities of solitude. Wartime associations seem still to have been quite vivid for Thomas and Paul Berçot’s Birth of the Siren also arouses them alongside mythological ones. The accompanying poem speaks of the Siren’s re-birth ‘in warning now / of the approach of aircraft / or of pain’s temporary all-clear’. Memories of World War Two even make their way into Thomas’s response to a 1905 Munch painting House in Aasgaardstrand where he sees a group of people waiting for time ‘like the Gestapo’ to come with ‘its van to take them away’. Such frivolity aside, however, the last extract I want to quote comes from one of the finest poems in the book which seems to be more obviously the work of R S Thomas, the priest. I like to speculate that the following lines relate to – and interestingly emphasise the collective application of – St Paul’s words in 2 Corinthians 3:18 And we all, who with unveiled faces reflect the Lord’s glory, are being transformed into his image with ever-increasing glory. the growing heaviness of that mirror. Of course the well-reproduced images – presented here in colour when Thomas only had them in black and white – make this a book to be enjoyed on two levels. It is however beyond this reviewer’s pay grade to comment on the pictures themselves or the extent to which the poems complement the art. Fortunately such questions are considered in a substantial and very readable introduction to this collection, written by the editors Tony Brown and Jason Walford Davies. This introduction also draws on other archival material to discuss a number of influences which may have affected Thomas during the composition of these poems. It is surely too much to hope that R S Thomas has left his admirers any more undiscovered surprises. But to receive this delightful cache of (slightly unpolished) treasures is rather like getting an unexpected and delightful bequest from a long-lost uncle.